As unemployment rates drop, finding and keeping quality employees becomes more competitive. How can you compete? One of the biggest reasons many people state for leaving their current employer is because of a lack of benefits. 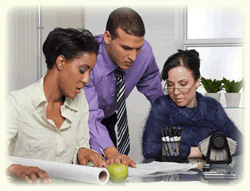 With Brusso Insurance, you can provide affordable benefits to your employees along with OPTIONS! Our Multi-Option product provides an opportunity for employers to offer two completely different benefit plans. This way, employees can select benefits that better fit their needs. When your employee benefit plan is designed, Brusso Insurance applies our 35 years experience solving the most complicated insurance issues that might arise. We listen to your goals, analyze plan features for you and identify the solutions that best meet your specific needs—and your budget. Plans are available for all size businesses including self-employed individuals. We can customize a plan to fit your company's needs. There's no longer any need to pay extra for benefits you don't want. Thanks to the our dedicated and professional staff, you'll be able to find health insurance designed to meet your company's exact demands for the best possible price. You'll also be able to speak directly to a broker who can help you compare health insurance plans that match your search criteria. No request is too large or too small!